“Dunkirk” is the right departure for cerebrally inclined writer-director Christopher Nolan (2014's "Interstellar"), counting as his first historically grounded film without any caped crusaders or mind-bending dreamscapes. Laconic yet gripping, this World War II drama plunges audiences right into the events leading up to the bombing of Pearl Harbor. Trapped by the Germans, 400,000 Allied soldiers attempted to evacuate the beaches of Dunkirk, France, in late May of 1940, and now, the rest is history. Nolan has figured out a structure that’s elegantly presented for the most part, as the events play out simultaneously, jumping across three perspectives on land, sea, and air during three timeframes (one week, one day, and one hour). 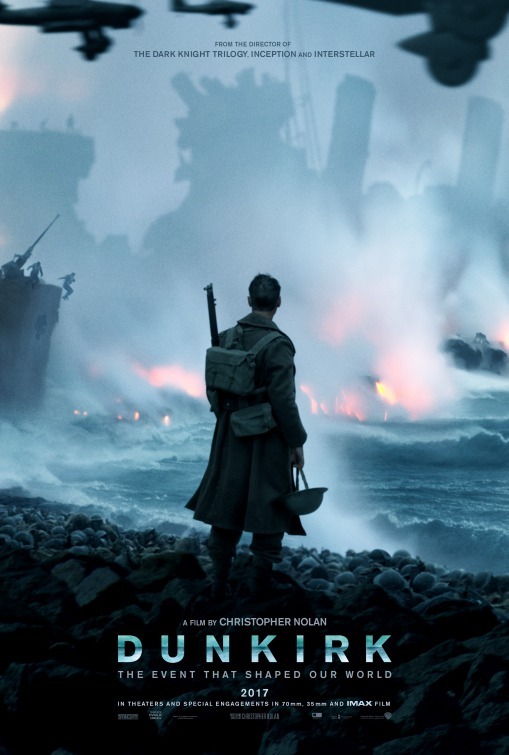 Slackless in its intensity and excellent in its technical prowess, “Dunkirk” is as vividly harrowing as it needs to be, but as there tends to be in Nolan’s work, an emotional aloofness holds back a very good film from being a great one. 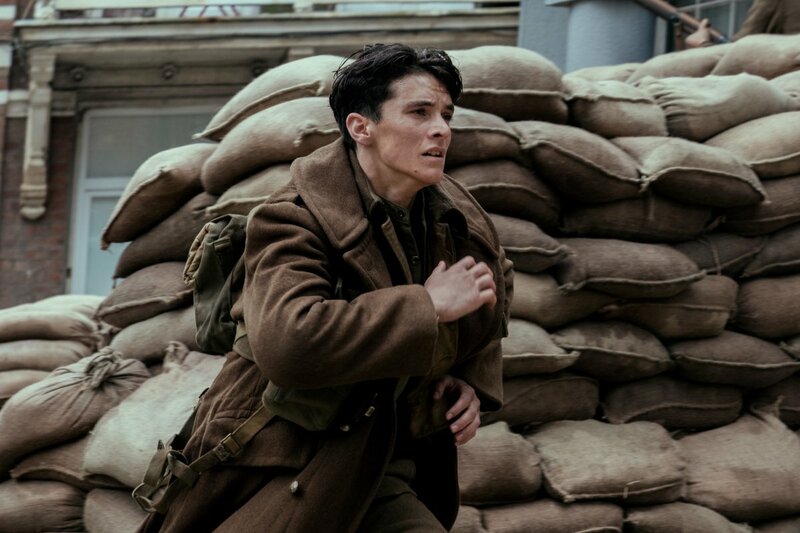 During a week on land, Tommy (Fionn Whitehead) is the lone British soldier to escape the sniper fire on the streets of Dunkirk. 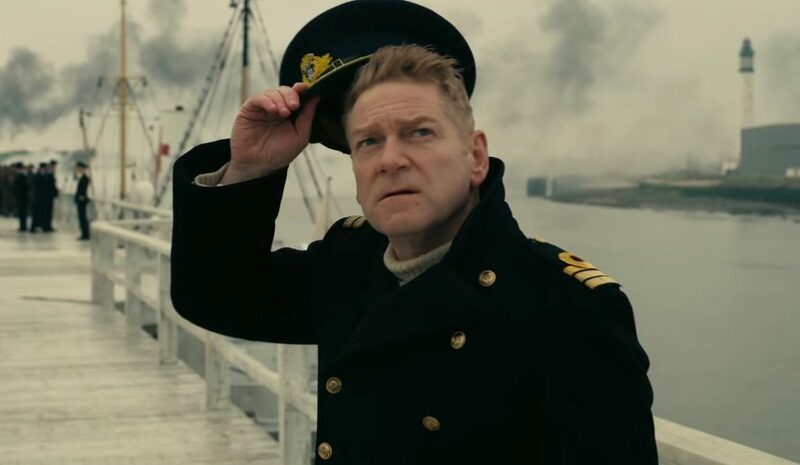 He soon finds himself on the beach with other Allied soldiers and Commander Bolton (Kenneth Branagh), who are all like sitting ducks waiting on the dock for help to arrive. Meanwhile on the sea, Mr. Dawson (Mark Rylance) volunteers to take his yacht across the English Channel with his son Peter (Tom Glynn-Carney), along with Peter’s friend George (Barry Keoghan), and pick up soldiers. Once they rescue the shellshocked survivor (Cillian Murphy) of a torpedoed ship, tension mounts when the soldier discovers the yacht is headed toward Dunkirk rather than away from it. In the air, Supermarine Spitfire pilots Farrier (Tom Hardy, again wearing a face-covering mask for his director) and Collins (Jack Lowden) make their way to Dunkirk. As a technical accomplishment and a war picture, “Dunkirk” is immersive and momentous. It’s a pressure cooker painstakingly mounted with you-are-there immediacy and minimal relief and dialogue, forcing the viewer to feel as defenseless as the soldiers. It’s more by design than an oversight that there isn’t one character to identify with or much characterization for the sprawling ensemble to dig into. 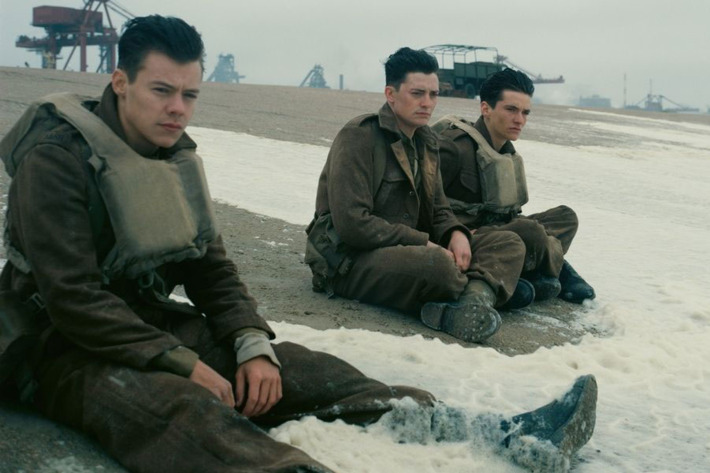 There is no one star headlining the film; instead, every face, no matter how recognizable like One Direction’s Harry Styles, blends into the wartime setting. The film holds the viewer at a distance from its human subjects sometimes, as Nolan doesn’t see much benefit in relaying the personal backstories of our heroes. Inversely, Nolan wisely avoids audience manipulation in the form of any hokey, tacked-on melodrama, a 'la Michael Bay's "Pearl Harbor." Deceptively simple for a film from Christopher Nolan, "Dunkirk" nevertheless finds use for the filmmaker's signature to tell his story with a time-shifting structure. Where each timeline comes into the other might be cleared up with a second viewing, but Nolan and editor Lee Smith keep the story building beautifully. Technically aces across the board, the film is masterfully shot by cinematographer Hoyte Van Hoytema (2014’s “Interstellar”) with the use of 65mm and IMAX cameras, and the sections spent in the air offer some of the most impressively breathless aerial dogfights seen on film. A set-piece involving a flooded ship intercut with another potential drowning in a crashed plane is also asphyxiatingly tense. Seamlessly one with the sound design, the music score by Hans Zimmer is distinctive and propulsive yet more chillingly subtle than his past work with the use of a ticking watch that enhances the overwhelming apprehension of the situation. “Dunkirk” is an enthralling primal experience that gets the heart pumping, even if it doesn’t ultimately move it.